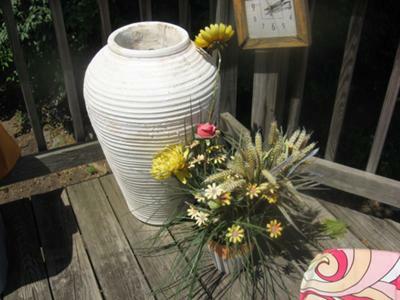 BUT,when I lifted the planter, deep deep inside the vase was a wren nest and 6 babies chirping away. I was in awe. Never would I have known this nest was there if my pup hadn't discovered it. What was this mommy and daddy bird thinking? They are well protected and even let me stand nearby as they deliver breakfast, lunch and dinner to their young. Nature is glorious and some animals take care of their young better than humans...that's my story and I'm sticking to it. Wrens have built a nest inside our garage. It’s in an old constitution hat that is hanging on a hook. The open side of the hat is facing the wall but there is a big enough gap for them to get in. When we are home on weekends and evenings the garage is open but closed when we go anywhere and at night. What do we do? I can sacrifice a fern for that sweet little family. I appreciate your feedback. Do nothing, the adults will continue to feed their young. 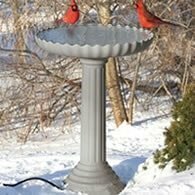 If you need to water, do so at the edges of the planter so the nest and young do not get wet. There is a wren who has taken over one of my front porch Boston ferns. Had no idea she had babies until I got a step ladder and looked over into the fern. The babies were there wiggling around. 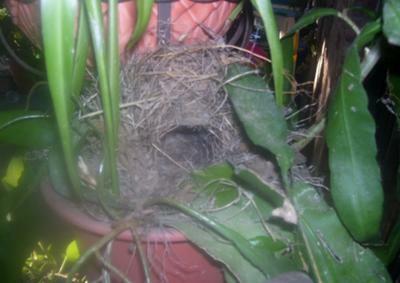 I had mistakenly watered the fern and the mother had flown out. So now I have been in a panic all day thinking I drowned the little babies, but they are still there wiggling and I have watched the mother come and go all day through my window. Should I feed her? What would she eat? I feel so guilty about watering the fern and then iscovering a little family living there. I noticed a wren building a nest on my front porch wreath it was always covered, today it was't covered and the wren flew out at me, will she come back? For the past 2 days, there has been a frantically chirping wren on my covered deck. I looked around and couldn't find the reason for its panic. This morning early, she was at it again. 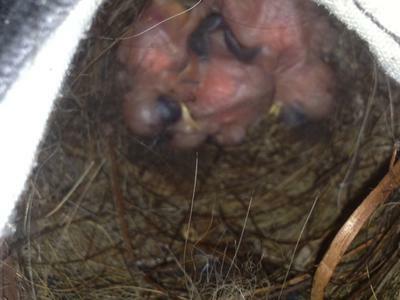 So with a flashlight, I searched again to find a nest with fledglings deep in an empty dog food canister. Evidently, it was time for them to leave the nest, and poor mom and dad didn't know how to get them out. I gently leaned the container over and left it at an angle to make it possible for them to climb or be nudged out, and the adult birds immediately went in, and have quieted down. I will check on them again in a few hours, but I think the problem is solved. When the adults begin to withhold food in order to encourage them to leave the nest, they'll get out. You can always lay the container on its side at the appropriate time. Not a day too soon though or you'll cause early fledging. Baby birds are never really anxious to leave the nest so don't be too quick to act. Are the Wrens in too deep? We've got a wrens nest in a deep, yellow LEGO bucket in the garage. I'm concerned that the baby birds will not be able to hop out of there. How deep is too deep (15 inches vertical) for a baby wren? Will they be trapped in there? 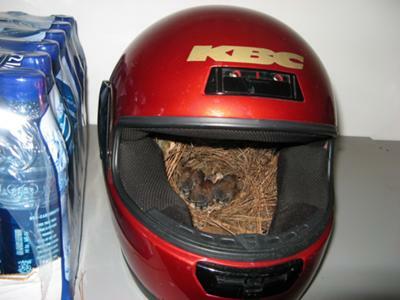 We had a wren build a nest in my husband's motorcycle helmet that was on a shelf in our garage. 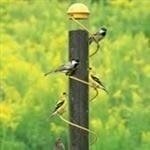 In the past we had been able to intervene before the nests had gotten too far along. They seem to love our garage! However, being hidden in the helmet, we didn't notice the nest until we saw the birds fly to the helmet. The eggs were already there and we didn't want to disturb it. When we left the house, we made sure the garage door was part way up so that momma bird could get in and out. Now we have 4 baby birds screaming for their breakfast, lunch, and dinner! I bought a Boston fern to hang on my front porch. A pair of wrens took it over. Now am afraid to water it as the eggs are hatched. Hoping the babies grow fast and leave the fern? 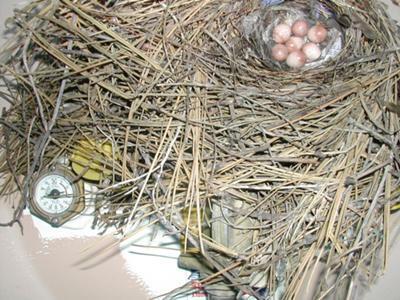 Did someone say wrens nest in strange places around the house? 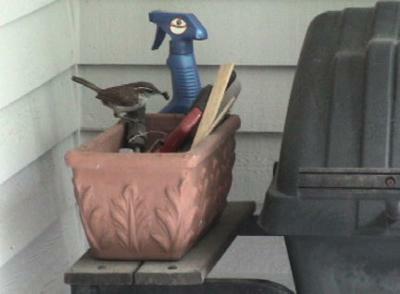 The wren family occupied a little rectangular tool box filled with garden tools on my second floor deck. The activity was incredibly busy all day long, bringing bugs for food and removing waste. They were the cleanest little family you could have for tenants. We took lots of video and now miss the family. 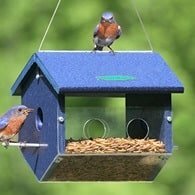 We had a pair for over 5 years here in Massachusetts and this year there is no sign of them. We are very sad. Our male wren has been scouting for a mate since the beginning of summer. 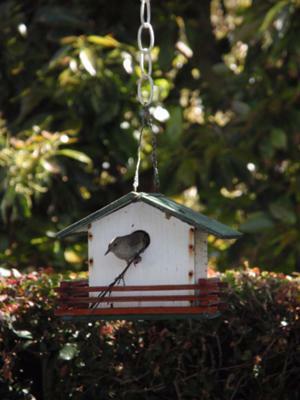 He's placed so many twigs in his birdhouse that some had to be removed. As of last week he sweet talked a female into the house. She is now adding nesting material and he's singing his heart out with joy. 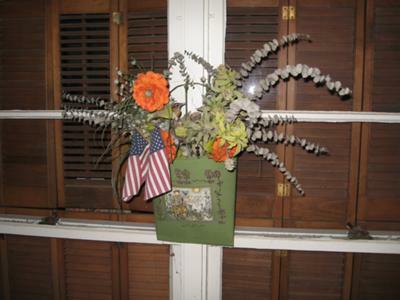 We have an artificial wall hanging flower arrangement on our back porch. For several years it has been home to Wrens. Recently during the cold weather we are having in north Texas there have been two wrens sharing the nest. There is a bigger male and a smaller female. I thought this unusual as this is the first time I have seen both of them sharing. I have a good picture of one of them in the nest and I will try and get a shot of both. This little Wren comes by my window daily to eat the suet I have hanging there. It sings so pretty and pecks on my window thinking it see's another Wren in there. I love watching it everyday. I take pictures almost daily of different birds and save every one and I hope all of you out there will enjoy the one I'm sending of this little Wren as much as I do. 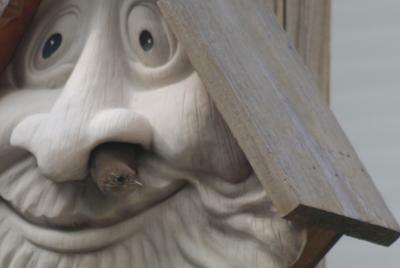 This little bird house has been up for a few years. 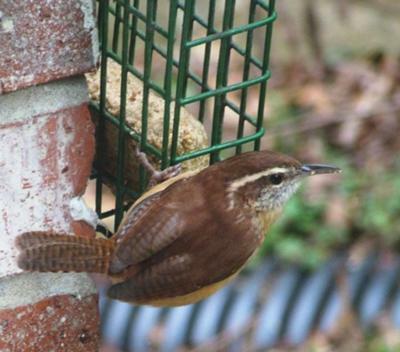 This year we finally had "wren"ters. It's fun to watch them fly in one side and out the other! 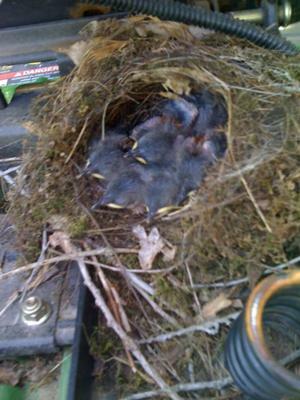 A few weeks ago my husband discovered a nest underneath his Lawnmower seat, but didn't think anything of it. A week later he mowed the lawn, not even remembering that it was there. When he was done he checked under his seat to find 5 eggs inside the nest. He was a little worried that all the jostling around from the lawnmower might have hurt them (our yard isn't flat, it's hilly and full of mole hills). Luckily we now know that the eggs were not harmed by the ride they took, because when he came home two weeks later and checked, there were five baby birds nestled all cozy in the nest. They are adorable! I had been keeping an eye out on the lawnmower every time I was outside and had noticed either mom or dad flying back and forth to the nest. Now though, the grass is getting tall, but we are unable to mow it! Looks like we're going to have to let the yard go for awhile before we're able to mow it again. Hopefully we won't get a lot of rain so our yard doesn't become a prairie in the making while we wait for these birds to leave the nest. 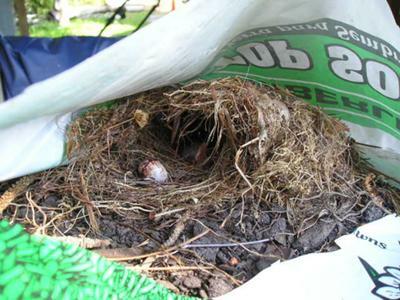 Wren Nest in Bag Of Dirt. Every time we went past a partially used bag of dirt a wren would fly out. Finally we peeked inside the bag, which was sitting on an an empty barrel, and saw the wren next with two eggs. Recently one egg hatched. It is such a busy thoroughfare that the mom is constantly flying out of the bag. The other night she rested in the bird feeder nearby her nest. Hopefully the hatched bird will be well fed so that it can fly off to return to nest in our yard next year. We will remove this bag so that a safer place for nesting will be chosen. 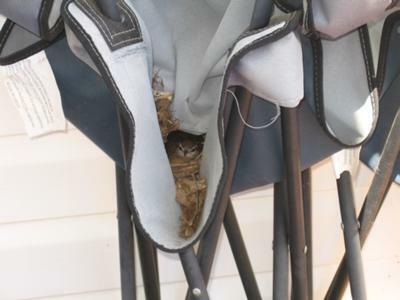 Thanks for this website which assured us that wrens do choose unusual places to nest! We feel better about this wren house in a dirt bag...and will go out to buy more dirt for the garden leaving this bag undisturbed. It is also good to know that the wren is used to humans because kids are constantly peaking into the bag to witness the baby bird openning its mouth for feeding. Comments for Wren Nest in Bag Of Dirt. We have a few camp chairs on our back porch that are not in use. The wren decided to start her nest. I noticed little by little that she brought pieces of the nest. Now there are 5 eggs in there and I can't wait until they hatch to show my 2-year-old daughter! 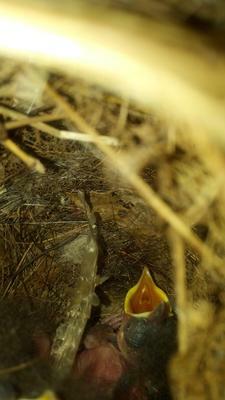 This was taken on Mother’s Day…see the see little Carolina Wren making a nest for her eggs upcoming. This is our little chiminea fireplace that has wadded up paper towel in it (we won’t be having a fire anytime soon). This little wren found this “safe haven” and is making a nest for her babies to be born. I watched her fly back and forth several times and then went for my camera. 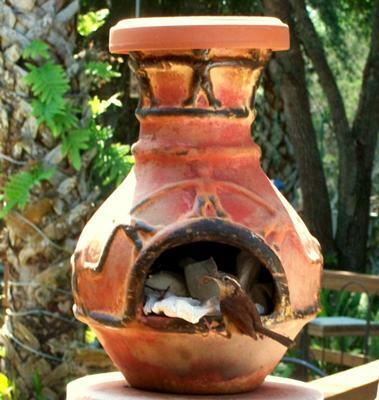 Two years ago a similar wren family moved into this chiminea and grew up three little chicks. We got to watch the parents feed the babies and I swear that the parents saved teaching the young birds how to fly until we got home from work. 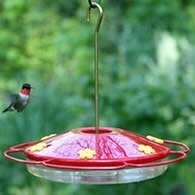 We happened to be outside and watched the parents bring the little birds to the edge of the opening…the parents would jump out and jump back in as though an example…then they went in behind and nudged one out. It jumped down to the cement and then they would show it how to fly down to the ground and back up again until all of them were out and almost bouncing around the deck learning how to fly…and then, they all did fly away…it was so precious, maybe we will be that lucky again…just had to share. 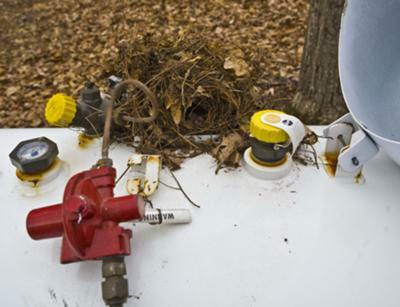 We found a wren nest on top of the propane tank in our yard. We have 5 eggs in the nest. 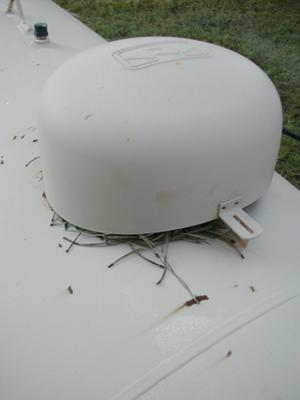 When my husband went out to check the propane level in our tank next to the house in the second week of June, he noticed quite a bit of debris seemingly coming out from under the lid. He gingerly lifted the hinged domed top not knowing what to expect. Neatly woven around the knobs and dials of the tank were assorted twigs, sticks, pine needles, and bluebird feathers. The debris field presented all the earmarks of a wren's creation. Tucked away in a cylindrical depression within the nest were 7 tiny eggs. 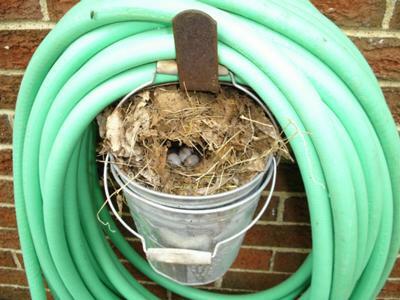 Since wrens choose unusual places in which to build nests, we are not too surprised that the bird parents chose the propane tank. It features a nice arching cover and good protection from predators. In addition, access in and out of the nest is easy for the wrens through a small arch where the fuel hose exits. With all of the tank's location benefits,we are quite concerned that the nursery under the lid was ultimately a poor choice. We've not heard or seen activity from the parents lately. During the day the tank can become quite warm and a little too intense to serve as a proper incubator. But we will keep watch and hopefully our tenants have not left due to "wrenter's" remorse. Wrens Nesting in Asparagus Fern! This is such a miracle! We saw the couple building their nest in my Asparagus Fern on our deck from start to finish, it was great fun to see them building their little house, but we were worried about the openness of the nest and if it was a good place for them to build their nest! Not long after that there were four little eggs, and now we were even more exited than ever! Now the long wait started and it was so cute to see her sitting on her little eggs and waiting in anticipation for the big day to arrive! And here they are, the four little miracles have arrived, I feel just as proud about them as I am sure mom and dad are and now we watch them grow every day and will be sad to see them leave again! 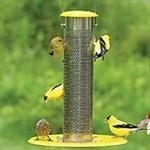 We pray they will be safe until they fly away from the comfort of their little home! A joy watching the pair of wrens building their nest. My husband noticed a little bird bringing sticks and tucking them into to flower pot outside our patio door. He brought it to my attention. We watched the little Wrens take turns bringing their nesting materials and tucking them carefully into the nest. I was surprised when they made such a deep nest. We have not seen the little birds since they finished their nest and there are no eggs in it. We have outdoor cats and although the nest is undisturbed they may have caught the little birds before they were able to start their family. We're leaving the nest as is and hoping they or another will return and use it. It will be a disappointment if we don't get to watch little fledglings develop and leave the nest. I had a pair of Wrens nest in our backyard this Spring. The babies left the nest last week, but the male has cleaned out the old nest and is re-building the old one in hopes the female will except it again! 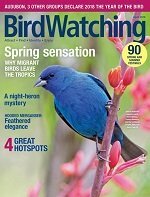 They are the most fascinating little birds to watch. 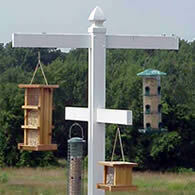 This is the first year a female excepted the bird house, so its been interesting to watch the pair. I have taken so many pictures that I have had a hard time finding one the viewers might enjoy. Eggs laid in the pocket nest! 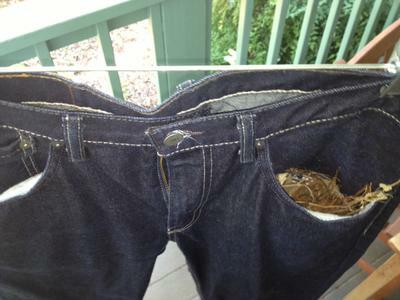 Pictures of baby House Wrens in the pocket of a pair of Levi jeans. Who would have thought that drying out ones shoes would invite a new visitor? We had just returned from a very wet camping trip and most of our shoes were soaked! My mom, my dad and myself left our shoes out on the side porch of our house to dry. My dad had a pair of brown tennis shoes, my mom had a pair of running shoes and I had a pair of pink rain boots. After we did that, our lives got very busy and we forgot about our shoes. Thankfully we had placed them on a table under the awing of our porch. I left my rain boots on the brick ledge under the awing leading into our house. About a week had passed and my mom had remembered about our drying shoes out on the porch. She went outside to get hers. My boots were caked with mud on the bottom so I had to clean them. My mom came in the house without her shoes and told me to be quiet and come outside. I went with her and she pointed out the nest that was in my dad's left brown shoe. We researched what bird it was by the eggs and discovered it was a wren's nest. We read that wrens nest in odd places. We later saw the female wren fly in to check on her eggs. Thankfully my korean jindo did not disturb them. He usually barks and whines at any small animals. My mom is worried now because it has been a least half a week and she has not seen the female come back to sit on the eggs. My dad and I have a theory that she only comes at night to incubate them. 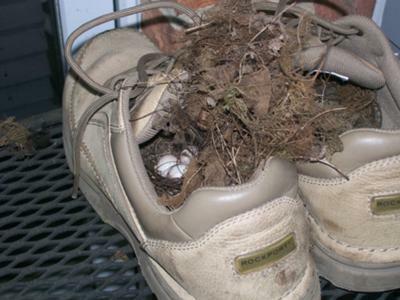 So that is the story of how our wet shoes attracted a feathery visitor. 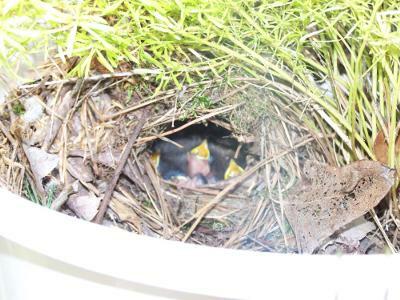 Hi, the eggs hatched and we had three baby wrens successfully fledge!!!! Oh thank you very much! We have seen the mother fluttering around now and then, so I'm pretty sure she is still sitting on them. They haven't hatched yet, so I'm waiting for that to happen. We are trying not to pry around the nest too much in fear we might disturb her. Thanks again! Elena, your story is very sweet. No nest-sitting is not a good sign, however. When the eggs are laid, Mama Wren usually does not leave. Papa Wren brings her food for 2 weeks until they hatch. Then they both work to feed the babies for 2 more wks until they're ready to leave the nest. This might be different if insects are scarce, and mama must find her own. Please let us know what happens. 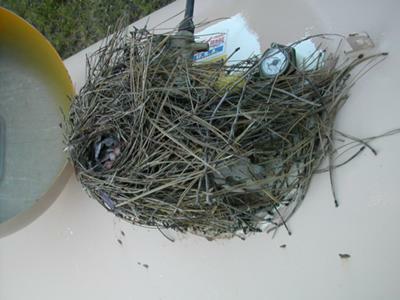 I guess it was around mid March when entering my front porch one day I noticed what appeared to be a nest in the base of my fan. I was very interested to know what bird had built this and when did this happen? I often have birds find their self onto my porch and stuck in the screen as if they cant find the door to go back out. Mostly humming birds, but I knew this was no humming bird nest! I remembered a small brown bird I had seen a couple of times on my porch but it always knew the way out. That had to be the one to build this nest! Sure enough I start to see more of this bird, then there were two. 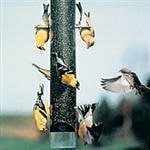 I wasn't familiar with the type of bird so I described it to my Father, who is my go to person when it comes to nature as he enjoys watching and learning about the birds all over his property. 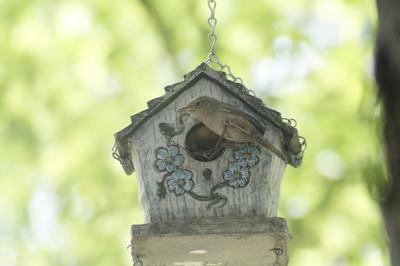 He suggested it may be a House Wren and after looking it up, sure enough he was correct! I get rather excited over the little things like this. While relaxing with some friends yesterday (4/28/13) on the porch we see the two birds flying in and out perching on the fence, the door then the fan blades. One of them was very vocal when singing his song to the other as she hopped around from perch to perch watching us closely peaking in ever angle she could. That's when I saw the insects in her beak. It was a small worm. She quickly fed her young then off they flew back into the yard. I got very excited and had to see the babies! My friend got a ladder down from his work truck and up I climbed stretching my arm with the camera in zoom with hopes to snap successful picture! After a few tries it was a success! I could count out 3 baby birds. In another shot I noticed what appears to be the snake skin, I thought that was rather neat. This morning after laying some floor down in my daughters room I came out to the porch to let the dogs out for a bit and what do I see? Mom and dad are up to feed their young again. While the mom peaked around to look at me I notice the food for this trip had legs. Sure enough they were feeding spiders to the babies. 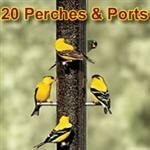 This began my research on the birds, where I found this site with the option to share my story. I will be sure to keep a close eye out for them now and hopefully get to see the babies leave the nest. My husband hung coats on the line to air out. 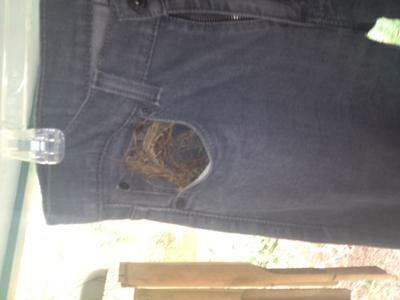 When I wnet to take them off, mama bird flew out in my face and I found 4 eggs in the pocket. Today when I checked they have finally hatched in the las couple of days. We had a wren build her nest in our sons motorcycle helmet in our garage. She laid 2 eggs yesterday amd today. We immediately went out and bought a bird cage. We put the wren and her nest in it but now reading about the males involvement , I don't know what to do. I want her to live and I want her babies to live. Should we put the cage in the garage so the male can get to all of them? I feel like I should wait till the morning to see what her well being will be. Please help! And.... Is this even the female wren? What if it's the male? 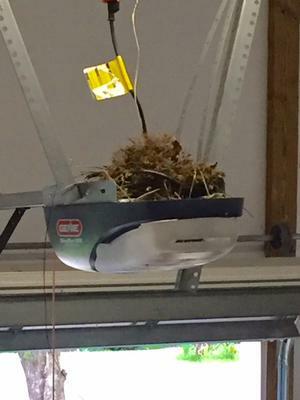 These little birds, I think are wrens have once again chosen to build a nest on top of our garage door opener. Our garage door is open most of the time. I am tempted to remove the nest but am swayed by these little creature(s) working feverishly to build a nest. I saw one fly over my head in the garage twice in 10 minutes today. The nest has grown a couple of inches tall in a day. They are hard working. We have decided to let them do their thing and wait for the laying, incubation and hatching of the egg, at our risk of burglaries etc by leaving the garage door slightly open. Hoping of course, when the baby birds come about they don't die landing on the concrete in the garage.